We’ve seen several updates to the disc drive; these are so well-known that people even put up entire websites that track them! Off the top of my head, there was DMS/D2A, D2B (like D2A, but changed mask ROM on one of the chips — probably for reason #1), D2B with cut legs (reason #4), D2C (reason #4), D2C2 (reason #4), D2E (unknown — reason #1? ), D2E + epoxy (reason #4), “D2nothing” (perhaps reason #2, but most likely reason #4). Clearly, these were mostly motivated by anti-piracy concerns. Note that this is the first revision of each chip — called simply “Broadway” and “Hollywood”. Protip: We can tell that the Hollywood chip was made in the 32nd week of 2006 (“0632”) and the Broadway chip was made in the 31st week (“0631”) — so, August or so. Unfortunately, not many people share my same sick fascination with taking their expensive consoles apart and photographing them, so it’s hard to find photos of a wide range of chips online. On the Korean Wii I bought, it had a “Hollywood AA” (date code 0812) and a “Broadway B” (0744). I assume that there was a “Hollywood A”; if anyone has one of these, please send me a photo or at least give me the date code from the chip so I can build a proper timeline. (I also have a “Hollywood AA” (0801) with a “Broadway A” (0747)), and a “Hollywood” (0636) with a “Broadway A” (0641). The chip differences aren’t really very meaningful to us. All of the chips have to run the same code. It’s likely that the revisions were done to fix minor glitches; for example, there are a few places in IOS where it checks to see if the Hollywood chip is older than some version, and if so, executes some additional code (redundant memory writes, presumably to work around a bug in the silicon). Note that the major difference between -01 and -20 seems to be that there are a few missing parts. Segher says that this is probably simplified power-supply circuitry; this will be important later. Leaving these parts off may have allowed them to save an extra dollar or so; I can’t think of much other reason for the change. It’s also important to note that neither the Hollywood or Broadway seem to have changed — they are still at Hollywood AA and Broadway B. The -30 PCB is what has me stumped. This photo came from someone on IRC who bought a new (“unsoftmoddable”) Wii in Australia; he sent it to me as part of our efforts to debug the HackMii Installer. The only difference between those two is … the Broadway chip package is much, much smaller. I’m told that it’s not likely that they actually shrunk the die; rather, they probably just shrunk the metal package, and placed the balls of the BGA package closer together. 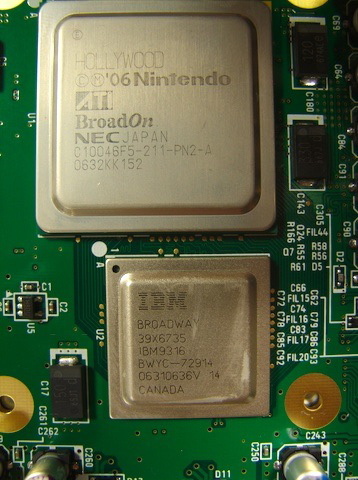 Unfortunately, I can’t read the writing on the Broadway chip in this photo; if anyone has a Wii with a small chip like that, please take me some pictures of the top and bottom of the PCB! My theory is that the switch from -01 to -20 coincided with the switch from boot2v3 to boot2v4, and that is when we started seeing reports of “unsoftmoddable Wiis”. I’ll cover the software aspects of this in a separate post. OMGZ!!!! I AM SO COOL11!!!11!!! I MADE TEH FIRST POST!!!1111!!!!!!! @ifish: It’s not that I’m embarrassed by how long it takes me to write them — it’s more that I’m writing about things that are months old because I’ve only just now found the time to sit down and concentrate and write a blog post I can be proud of and have proofread. I’ve posted about DSi (and even non-gaming stuff) here in the past, and will continue to do so. There’s not much to report — we demonstrated a savegame exploit for DSi-mode a little while ago (which has since been reimplemented by others), but it requires a game I can’t play on my Japanese DSi (oh, the pain of being an early adopter). loopy continues to be the only one who has been able to poke at the system without using a savegame exploit; I had the good fortune of meeting him at DefCon, but I’m still not privy to any of his secrets. Most of the progress right now is being made by scanlime, but it’s quiet, tedious work. Very interesting and nice post. So old Wii’s have better hardware than new ones, actually? Hi, I have a “Hollywood (not AA) ” (0737) with a “Broadway B” (0737). C/RVL-CPU-01, A-2 SIDE-B, NTSC US, Boot1 whit bug. yes more Wii news! it’s good to hear you guys are really examining things so closely, sadly I don’t have a lot of hardware knowledge so don’t want to crack my wii open but thanks for sharing this info. with bootmii and the MIKE kernel I can now run Arch Linux on my Wii with the internal wireless working. woot. Thankyou for another good read Bushing. The motives for revisions is something I had pondered before – and generally had the same conclusions as you. There is another DVD-ROM revision floating around, dubbed D3-2. It basically looks identical to a D3(D2Nothing) in terms of hardware, but the serial number starts with an “F” rather than an “E”. When a ‘ribbon’ style mod chip is attached, it will play originals from any region, but not any burnt discs. Whether this means they have removed the DVD video calls, or just changed the way they work – I’m not sure. There is an obvious difference in noise coming from the drive when running an original with one of these chips – so it seems they are smart enough to just let originals run as intended. The nasty cIOS style mods also don’t work with it (apparently)… and I suppose DVDx wouldn’t either. Why would they shrink the pitch of the BGA balls and not the die? Wouldn’t a smaller pitch increase the risk of errors during reflow soldering? I think if they were going to do any major changes like pitch size, they’d probably add some bug fixes, which means extensive testing, so they might as well do a die shrink anyway. Perhaps they wanted to make it harder to solder wires into the vias under the balls (i.e. make it harder to install a mod chip)? Is there anything on the bottom side of the PCB, or is it just like bypass caps and stuff? I noticed a conspicuous lack of high-frequency bypass caps around those huge Hollywood and Broadway chips. this one baby has a couple of weeks and where fully bricked (as bricked as it can) to the point the wiimotes don¡t sync anymore (so i guess the bluetooth driver doesn’t load up). all thanks to the ppl who sold it to me, they made me do a downgrade to 3.2 and it got that way. here’s my mail if you want some more details or you can give me a hint on how can i recover my nand. Hi, I wonder if you can help me with this Bushing? Apparently, some of the later Wii hardware revisions had slightly better image quality than the earlier ones via component though. I’ve been told that these are probably some the later models – RVL-101 – the ones that had no Gamecube ports. 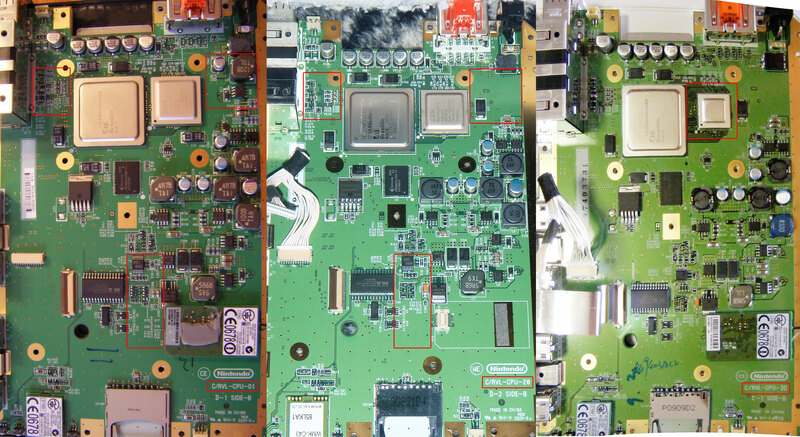 Do you have any more in depth information as to exactly which hardware revisions have this ‘upgrade’ in image quality?